Having a place to jot down a few notes, scribble down that all important client phone number or simply let your imagination come to life is always useful. There’s no end to the creative ideas you could come up with that have the potential to take your business to the next level. Everybody has at one time or another found that bit of scrap paper, or back of an envelope or even bit of a cardboard box to make sure that stream of consciousness thinking doesn’t get lost. But what happens when the cleaner throws it away by mistake ? or when you lose it amongst the other clutter on your desk ? Notepads are brilliant for this sort of thing. You can keep all your notes and/or ideas in the same place without the risk of losing them. However, in this digital age, is there even a need for the humble notepad anymore ? Don’t all phones have a note-taking function on them ? Besides, if you’re sitting at your desk, won’t you be able to to take notes on your computer anyway ? These are all good points, but there are a few factors which have been overlooked and at Kaizen, we make a point of getting the small details right. We’re experts at catering your business and promotional items specifically for you, so it would be remiss of us not to point out that there is more to notepads than meet the eye. For a start, yes, you’re phone probably has some kind of app that allows you to make notes and yes, it can be automatically uploaded to the cloud where it’ll stay forever and ever with the rest of your files. However, have you ever been talking to someone, and they just pull their phone out and started playing with it? How rude is that ? Now imagine how much worse that would be if it was you in a meeting or a job interview. Your professionalism would go out the window and potential clients or employees or business partners might resent you for it. Using a notepad to take your notes is a much more professional way to go about it, it let’s the people in your meeting know you’re paying attention and potential clients know you’re interested in what they have to say. But if that is the only use for a notepad in your business, is it really worth investing in a few ? We think so, because apart from its obvious uses, notepads can make a really useful marketing or networking tool. Give them out as a gift at a conference or a complimentary item and suddenly customers and clients have something with your logo on it taking pride of place on a desk at their office, using it for all the things we talked about above. Your logo or design will be on your choice of notepad sizes and can be printed in full colour on our 120gsm uncoated paper across our range. 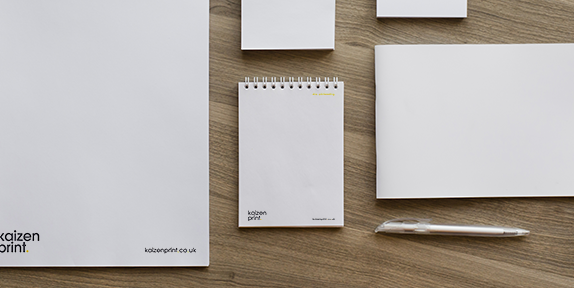 And with Kaizen’s notepads coming in a range of sizes, we’re bound to have the ideal notepad for you. You can check out our full range at http://kaizenprint.co.uk/small-format/notepads.